The next day Henry arrived at his office bright and early. Francis wasn’t in yet, as he preferred to roll out of bed at the crack of noon. It was quiet and Henry took out the pencil and a pad of paper. He looked at the pencil again and then used it to write down 1, 2, 3, 5, 7, and 23. He added the number s up and they equaled 41. Next he assigned each number a letter, a, b, c, e, g, y. Leaning back he pondered his first two attempts, scratched his head, and dismissed them. Twenty minutes and three more dismissed theories later, the sound of heels on the hardwood hallway floor caught Henry’s attention. He was a bit of an expert on the gait of people. He could tell when it was Francis, he could tell when Big Mike was coming, and he could tell that it was a woman who strode with confidence. The door opened. She stood there momentarily, as if to say, I am here, take me in, I am marvelous. Wearing a Dior dress she had a figure that made an hour glass self conscious and she knew it. She walked in and set her tiny purse on the corner of the desk and asked, “Are you Henry Wood?” in a voice that was dark and hypnotic. “My father recently passed away…” she said with a pause for a respect full sigh. “I am sorry” Henry said. “Issues?” Henry said with the voice he reserved for those occasions when he knew he was being fed a line, but didn’t want the feeder to know. It was slightly lower with just a smidgeon of empathy. “Smith, Havershome and Blickstein in town and the man is Mr. Alexander, I think he is an accountant or something.” She said, with a casualness that was a bit too casual. Henry considered taking offense at her remark about Manhattan being ‘in town’, as if Brooklyn wasn’t, but her legs were really well crossed. “Why do you think he is out to get you?” Henry asked while trying not to look at her legs and intrigued that yet another person is looking for Mr. Alexander. “An accounting journal, being kept by an accountant that seems pretty standard, wouldn’t you say?” Henry said, hoping to pry something out of her. “I believe he had found some irregularities in my father’s books, some tiny little omissions, and he wants to ruin my father’s good name and me in the process.” She said with another, albeit sadder sigh. Apparently the thought of losing her inheritance was worse than losing her father. “Why don’t you just go to the partners and ask them to straighten him out? Surely they wouldn’t want to lose you as a client.” Henry asked, knowing that she would have a polished and prepared answer, but he liked to hear her talk. “They don’t know where he is. It seems he didn’t show up for work yesterday. I need you to find him and get that Journal!” She said, this time, with an air of entitlement. “I have been told that you are looking for him already. I just ask that when you find him, you bring the journal to me. I will pay you five thousand dollars. Here is half now and half when you deliver.” She said and stood, handing Henry a plain envelope, grabbed her purse and left. “Is there ever?” scoffed Don. He spent most nights prowling the streets looking for seedy scoops. Francis just shrugged. “Hey let me you ask you guys something?” Henry nodded towards his office. “Sure Ace” what is it. Don called Henry and everyone else Ace. He was bad with names. “I hadn’t noticed that.” Henry said, giving Don a nod of appreciation. “There are 4 missing numbers.” Henry said out loud, but mostly to himself. “I wonder…” and his voice trailed off. Don and Francis could tell that Henry’s wheels were turning so they headed across the hall. Henry needed some wood time, so he grabbed his overcoat and hat and headed home. When he got there the closet was empty, as it was most days. He took a piece of oak and rubbed his hand over it. What would this be good for? Henry thought to himself. He grabbed a ruler and a non-clue pencil and made some marks. The wheels were still turning. The little piece of wood seemed to want to be turned into a tool holding device. Henry wanted to use the rare earth magnets he had bought some time ago, so he decided he would combine them with the oak and hang it on the wall. He carefully marked out the spots. 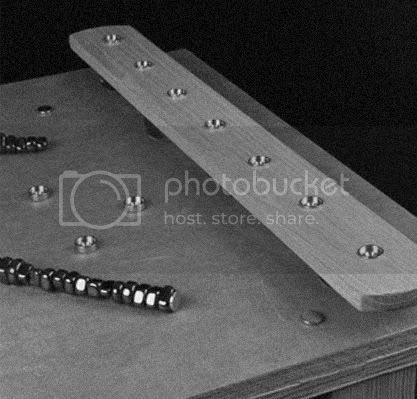 He would use his Fostner bits, to drill out holes for the magnets. A quick practice hole in a piece of scrap and he was ready. The seven holes drilled out easily. Henry screwed in a magnet holder and was inches from plopping in a magnet when he realized that once it was in, he wouldn’t be able to get it out. Those suckers really stick together and the screw would have been hidden under the magnet. It was almost a blunder, but his brain was thinking several steps ahead, just like Mr. Alexander seemed to be doing. Henry sanded the board for an hour and now was considering if he should stain it. He had some General Finishes Georgian Cherry Gel Stain that had mysteriously appeared in the closet. He wasn’t sure exactly how to use it, so he decided to think about it for a day or so. Like a bolt of lightning out of a clear blue sky the number 17 jumped out at him. He felt like the fog was slowly clearing. He was suddenly overcome with hunger and set out to find some dinner. He sat down at the kitchen table and pondered out loud, “Mr. Alexander knew I would go to his office. He knew I would notice the pencil. He is a cautious and meticulous man. He wouldn’t just write down the clue. He would hide the clue.” Henry was now convinced that the real clue was 11, 13, 17 and 19. Now I have to start over with new numbers! So, I guess you know I can’t go to bed now until I read this blog. And, I’m already depressed because Monk quit on me. (I was usually about 92% sure who done it about 85% of the time.) Now I read this and it’s about an accountant who seems to have done it and I’m an accountant too. Right now I’m only 75% sure that the projects Henry works on are what you’re working on about 60% of the time. (If that’s right, be sure you don’t accidentally strike your rare earth magnets too hard with the metal tools because they can shatter rather violently I’m told.) And I’ve got no clue who done what. Anyway, I’m just wondering if this is a mystery like the season 1 or 2 Monks that you could figure out if you paid close attention to the details as the show went on but, who done it was sort of unexpected. Or, is this like the last two or three seasons where you new up front who done it and the mystery was in how Monk was going to catch them. I much preferred the early Monks so I could figure it out before the wife and kids. But, if this is an early Monk, I’m going to be really depressed because it’s just not clicking. So, Brian, should I be breaking out my Excel and plotting alphabet numbers forward and backward, reading some numerology sites, and checking out some cypher books at the library or what? I am sorry to have become a pediment to your sleep. I know how cats love their naps. I had two magnets find one another tonight and the one did break into 4 pieces. I was careful after thant. Yes, the woodworking bits are my real projects. It is just more fun to tell my woodworking stories this way…I hope. As for what is to come, I am not saying. It seems that people are enjoying the story, so I may let it run a while. I will occasionally have posts like yesterday, to take days off from the pulp. Don was very clever in figuring out the ‘missing numbes’ a couple of days ago, so I decided to include him in the story, as the photographer. I hope he doesn’t mind. To be honest, i really want to focus on your woodworking content—but the story gets in the way for me. I am interested in your woodworking experience because we are both sort of beginners at that. I know I’m not your only reader so keep having fun, if you are (it looks like a lot of work!). I’m looking forward to seeing the results of your next efforts even if you just do experiments with new tools. So leave a comment. I am listening, so to speak, I am actually reading, but you get the idea. Lets not be in to big a hurry to kill off the story just when we get a nice little conflict of interest and the potential for a little fem fa tale peeking around the corner. Brian, I enjoy the story as well as the woodworking. As for me keep up the good work! Both kinds. Please keep the story going Brian. Any numbers above 3 tend to give me a headache, but I’m willing to make the sacrifice for the sake of the entertainment value. I will share a little anecdote, as I believe it relates to the question of your blogs Brian. Those out there, that may still remember the Marx brothers should be familiar with Harpo, the silent, buggy horn blowing harpist. When he was young, he found an old harp that belonged to the family and taught himself to play it. He had no musical training, he just experimented. Years later, he decided he wanted to know the proper way to tune and play the instrument, so he hired a musician to teach him. His tutor spent a session watching him tune the harp and adamantly refused to teach him anything. Why? Because Harpo’s style and methods were so unique he did not want to spoil that magic by teaching him conventional methods. So, in that spirit Brian, I would have to say don’t change a thing. We all have our methods of working and exhibiting our work. I would have to say your method is one of the most unique and creative of the lot. So I, for one, would not want to suggest anything that would interfere with that process. It is your mojo. You use your magic as you see fit. It seems that the votes are leaning towards ‘remain on course’. The polls are still open if you wish to chime in. Keep it going, ‘remain on course’. Thanks to my Mom, who correctly pointed out that I used ‘gate’ and not ‘gait’. She is so smart.